What Does “Who Owns This PC?” Mean in Windows 10’s Setup? The Professional version of Windows 10 asks you who owns your PC during its first-time setup process. It’s not completely clear what this setting does, though. This option only appears in Professional, Education, and Enterprise editions of Windows 10. Home editions of Windows 10 don’t have access to domain-joining features. RELATED: What is a Windows Domain and How Does It Affect My PC? Your answer to “Who owns this PC?” just controls whether your PC is connected to a domain or not. This includes either an Azure AD (Active Directory) domain hosted on Microsoft’s servers, or a traditional Windows domain hosted on an organization’s servers. A domain allows an organization to centrally manage your computer’s settings and provide resources to it. If you’re part of an organization that offers a domain, choose the “My organization” option and you can join your PC to a domain during the initial setup process. If you’re not part of an organization that offers a domain, choose the “I own it” option to create a normal Windows user account. You may have a device provided to you by an organization that doesn’t offer a domain. If you do, you’ll have to select “I own it” even though your organization actually owns the device. If you select “My organization,” you’ll have to sign into a domain to continue. It’s confusing, but the question isn’t really asking what it appears to be asking. 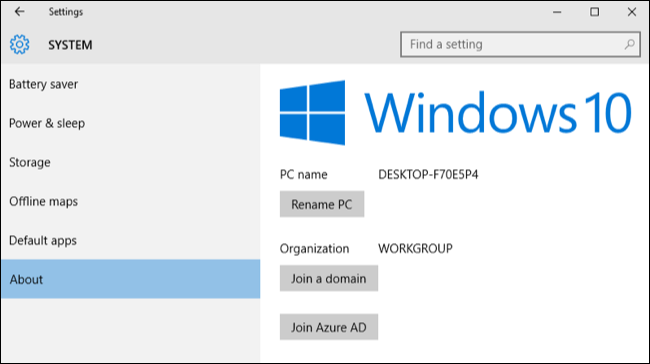 In other words: If you want to connect your device to a domain during setup or immediately afterwards, select “My organization” and you’ll see options for joining Azure AD or a domain. If you don’t want to connect the device to a domain immediately, select “I own it” and your computer will be set up without connecting to a domain. You’ll provide a Microsoft account or create a local user account to login, like normal. Despite the warning that it “Isn’t easy to switch later,” you can in some cases. Even if your employer owns the device and you need to connect it to a domain, you can safely choose the “I own it” option to skip connecting to a domain. In other words, you can change this decision at any time, but you can’t easily migrate files and settings between a domain profile and a normal Windows user profile. You’ll want to connect to the domain immediately, if you plan on connecting to a domain at all. That’ll let you avoid the hassle. Windows 10 offers another way for you to join a device to your organization’s network and resources. This feature is called Work Access. It’s intended for devices you personally own, but which need to be managed by your employer or school in some way. It’s a more lightweight alternative to traditional Windows domains. 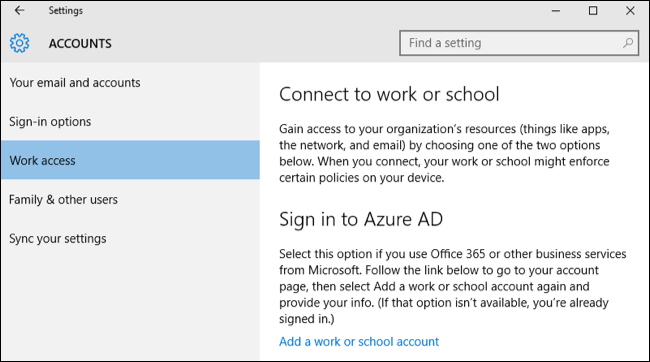 If you need to sign in to Azure AD or enroll in mobile device management with Work Access, you’ll still need to choose “I own it” during Windows 10’s setup process. After you finishing setting up Windows 10, you’ll then need to visit the Settings screen and sign into a work or school account from there. You can add or remove these accounts at any time. In other words, you don’t need to say your organization owns the device to use these new Work Access features. Signing into an Azure AD domain and enrolling in a mobile device management server are things you can do while saying you own the device. They’re also easy to undo later, unlike the process of joining a domain. Yes, Azure AD is mentioned in both places. You can either join your device to an Azure AD domain or simply sign in to Azure AD on your own device. Windows 10 makes it possible to apply different policies to these different types of devices. Joining a domain is intended for devices your organization owns, while simply adding an Azure AD account is intended for devices you own. The wording can be a bit confusing if you’re part of a smaller organization that provides you with a device, but not a domain. In this case, you can just think of the question as reading “Do you need to join your computer to a domain?” with “Yes” and “No” answers.